Commuters at Newbridge station in Kildare. SOME COMMUTERS who travel by train within the Short Hop Zone (SHZ) will be hit with a ”substantial once-off increase” due to the restructuring of the scheme’s boundaries. Two weeks ago, the National Transport Authority (NTA) reformed the boundaries of the commuter rail zone in the Dublin region – known as the SHZ. Currently the SHZ extends approximately 35 kilometres from the city centre to Balbriggan on the northern line and Kilcoole on the southern line. On the Kildare and Maynooth lines the SHZ only extends 26 kilometres to Maynooth Station and 16 kilometres to Hazelhatch station from the city centre. The NTA, who is responsible for determining the price of fares for subsidised public transport, said it has now decided to align the distances. This is good news for commuters travelling to the city centre from Naas/Sallins and Kilcock stations as they have now been brought into the SHZ and will pay lower fares. However, due to the restructuring of the scheme, fare bands will also change, with the NTA explaining this will result in a small proportion of the total number of commuters within the SHZ having to pay a “substantial once-off increase”. Unfortunately, it is not possible to make the transition to a more equitable rail fares structure without impacting on some customers. This is regrettable but unavoidable. Fianna Fáil TD Thomas Byrne told TheJournal.ie that the reforms will mean commuters travelling from Naas/Sallins and Kilcock stations “will pay almost half of what they were paying, which of course is welcomed by my constituents”. However, he said there are flaws in the reformed scheme. Byrne said there is “outrage” from locals over plans not to bring Gormanstown station into the new plan. He questioned why some stations were chosen over others to benefit from being taken into the scheme. “There is outrage from local commuters, many of whom travel to Dublin every day, many of whom are originally from Dublin,” said Byrne. The NTA said that “the reality is that there must be a boundary between commuter and intercity areas on the rail network” and confirmed it would not be extending the boundary beyond the 35 kilometre mark on any of the rail lines. The NTA states that it is aware that the intercity fares “do not offer the same value as the SHZ fares when distance factors are taken into consideration”, but said it has therefore not increased any of the intercity fares. Byrne said it was not equitable or fair to commuters who are travelling the same distance but paying higher fares. 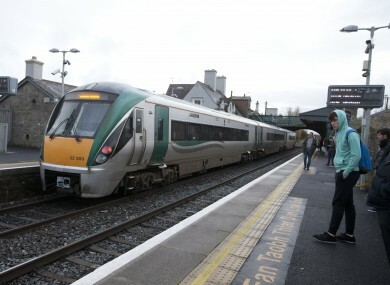 “Why were those stations picked and others not when they are similar distances away, yet commuters will be paying much higher fares,” said the Meath TD. This view was echoed by Kildare South TD Fiona O’Loughlin who explained that the fare scheme is just not equitable for commuters. She said Newbridge has a lot of commuter traffic and should benefit from lower fares. O’Loughlin said she has asked the Minister for Transport Shane Ross about the issue, but he said it is a matter for the NTA. She has since sought a meeting with the group to discuss the matter. Byrne said there are wider issues to be considered in relation to bringing certain stations into the commuter zone. He said not extending the boundary to Gormanstown is not good practice as commuters are already driving to Balbriggan instead of Gormanston station. It’s already much more expensive to travel from Gormanstown, he explained, adding that if Gormanstown was brought under the umbrella of the SHZ it would mean less traffic in Balbriggan. “This already leads to a clogging up of Balbriggan town and increase traffic to the station as people are not going to want to pay more,” said Byrne. According to the latest Heavy Rail Census from Balbriggan station had 1,872 daily boardings at the station in 2015. This figure has risen from 1,757 in 2014. Of those passengers travelling in 2015, 1,781 were travelling southbound towards the capital. Last year Gormanstown station had 72 boardings per day. The number of passengers boarding at Gormanstown has been falling since 2013, when 113 boardings were recorded on the census. O’Loughlin said a similar situation could develop in Sallins. “It is important to encourage people to use public transport but in reality it is very expensive. Under this plan, we could see people driving to Sallins and parking there in order to get the cheaper fare, which sort of defeats the purpose. “Parking in these areas could also be affected and it could block up the roads,” said O’Loughlin. Newbridge had 1,067 daily boardings at the station, while Naas/Sallins daily passenger boardings has been rising the last five years to 1,018 in 2015. Byrne said it is not a fair travel policy and called for the scheme to extended as some commuters ”are missing out on the cost saving measures”. Email “"Substantial once-off" fare increase for some rail commuters in the Dublin region "unavoidable"”. Feedback on “"Substantial once-off" fare increase for some rail commuters in the Dublin region "unavoidable"”.